Renault Customer Care told me if I had taken delivery after 1st of Nov (i.e when the offer was in effect) then a compensation can be worked out. So those who took delivery of their AWD after Nov 1st but booked the vehicle when this offer was NOT in effect, can speak to Customer Care or dealer and get more details. Renault customer care is again denying their statement and refusing to escalate the issue to their sales authorities. Any contacts within whitefield renault to speak to? @micrographics - Did you hear back from renault on this? My dealership have not helped, all they do is make us contact customer care. I would suggest following up with Customer Care only. I got the indication only from a Customer Service Agent. Try contacting them again, maybe they have changed their stand on this. I received a call from Customer Care stating that they have sent my message to Renault higher-ups. Will update you as soon as any response is there. Last edited by niv26 : 12th November 2014 at 00:59. Which has the best low speed ride quality( the ability to soak up potholes without transmitting them to passengers)-xuv500, duster 2wd,duster awd,innova? Please arrange them in the order of their ride quality. Why not take a TD of these vehicles and decide for yourself. Stuff like ride quality is quite subjective. For example, many people swear by the plush ride quality of the Safari DICOR, others find it too cushy and wavy for comfort. IT also depends on experience. Somebody driving a hard sprung car will find all these vehicles very plush, but somebody used to SUVs may find them normal or hard riding. I am looking for subjective opinions. A friend asked me this question. To take a test drive of these vehicles I have to travel about 80 kms. I could get testdrives at my place but don't want to trouble these guys as I am not buying. On a more serious note, XUV 500 and Duster AWD are going to be at the top, with Duster 2WD and Innova occupying lower half. But Storme beats all of them when it comes to low speed ride quality. Since you live in Thrissur, I can answer your questions to some extend since I drove a duster flat out from coimbatore to Ernakulam and you know the roads I am talking about. Duster completely obliterates any bad roads. I never felt the suspension bottoming out anywhere. Besides you get the car like handling in addition to the high ground clearance and excellent suspension. If you don't need AWD the 2WD suspension is good enough. AWD is even better. XUV500 suspension has never been sorted. You can ready and understand this from reading any of the upteen reviews availble online. Innova ride is very good, but end of the day it is a body on frame vehicle and they are generally not as comfortable as Unibody/Car based vehicles. But as Tsk said, replies to your post will span both artic & antartic. If you are serious, go the 80 kms and drive them yourself..
6. ESP light came on twice (blinking) in what seemed to be a perfectly good road and in no way an unstable scenario. Nevertheless, good to know it works. 1. will aftermarket door beadings work? 2. Any references in bangalore for door pad reinforcement/Sound deadening? 1. 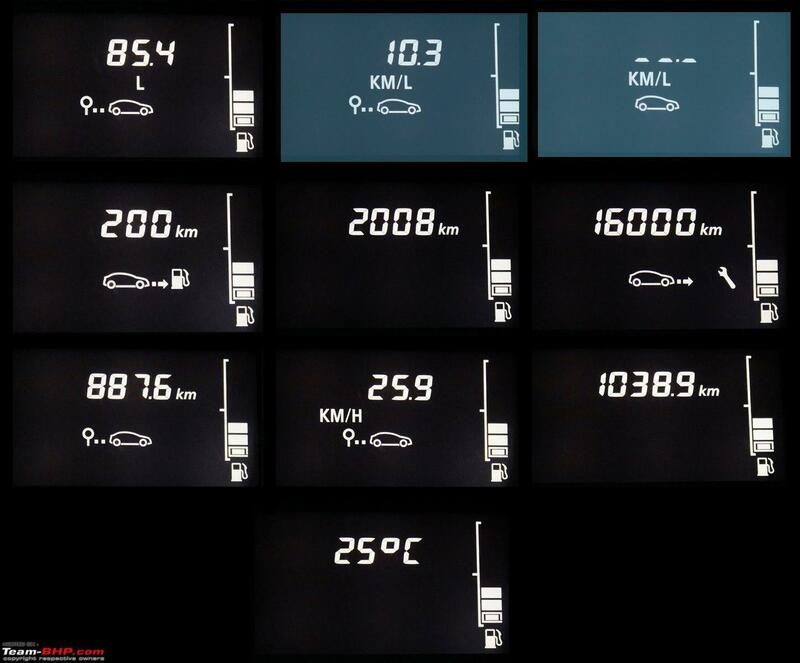 The Digital Display is having two KM/L indicators but one always remain ZERO. Don't understand why Renault has given 2 Nos. 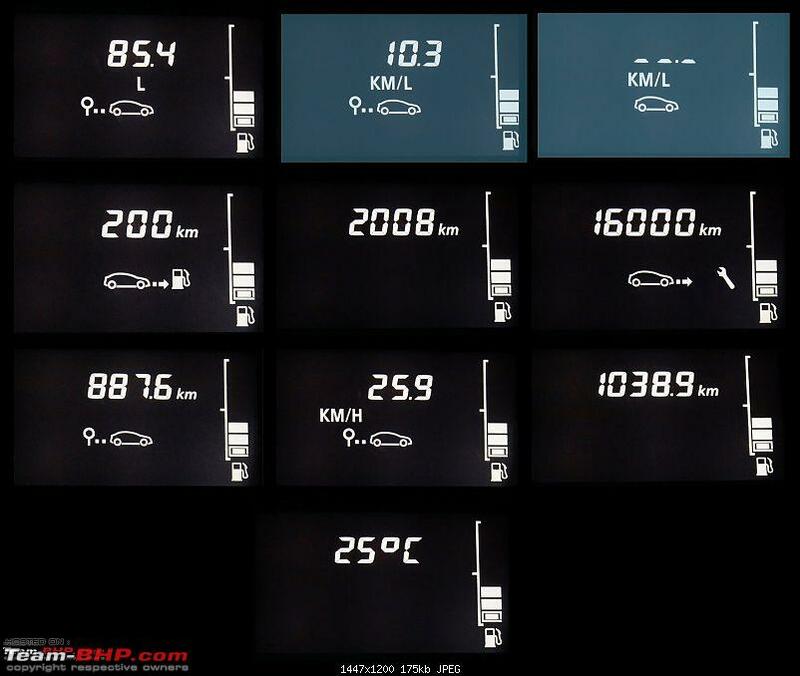 of KM/L displays. 3. Even in City driving, I felt that headlights are not adequate and am thinking of upgrading but am not sure how to get it done. Which Headlamp will be good enough to throw better light on road. 4. As I've not driven outside Bangalore so can't comment on Wind noise. v6kgang, please let me know once you upgrade headlamps, about the cost and place from where got it done. One is instantaneous / real-time, whilst the other is trip average. The real-time fuel efficiency will only show when you are in motion. I did reset everything but still it is showing same. See following image where I've highlighted both the KM/L with squares. Even in your pictures on page 1 same is the result. Last edited by micrographics : 15th November 2014 at 11:22. Ive heard that terrano has better sound insulation and plastics than the duster, this is from an user, of terrano. however no where, it has been mentioned about this in any auto journals. how far is this true. are we actually paying a premium for the younger cousin.